Animal Models for Examining Social Influences on Drug Addiction, Volume 140 in the International Review of Neurobiology series, provides insights on social factors that mediate drug addiction. 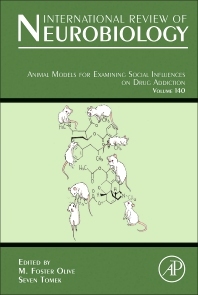 This book discusses current research and projects, with specific chapters focusing on Social Influences on Nicotine-related Behaviors in Rodents, Models of Alcohol Intake in Social Contexts, Social Factors in Ethanol Sensitization, Social Modulation of Heroin Intake, Amphetamines and Social Aspects of Addiction, Amphetamines and Social Aspects of Addiction, Social Models of Cannabis Use, Oxytocin and Rodent Models of Addiction, Social Place Preference and Reward, Social Defeat Stress, and more. M. Foster Olive received his Bachelor’s degree in Psychology from the University of California at San Diego in 1991, and his doctoral degree in Neuroscience from UCLA in 1997. His postdoctoral research was performed at Stanford University and the University of California at San Francisco. His research has been published in journals such as Psychopharmacology, Biological Psychiatry, Journal of Neuroscience, and Nature Neuroscience, and he currently serves on the editorial boards for Neuropsychopharmacology, Addiction Biology, Neuropharmacology, and Frontiers in Pharmacology. Dr. Olive’s research is supported by the National Institute on Alcohol Abuse and Alcoholism and the National Institute on Drug Abuse.